This winter, from the author of The Queens of Renthia series (which I enjoy quite a bit) comes a new tale about a young woman from family of thieving were-dragons. 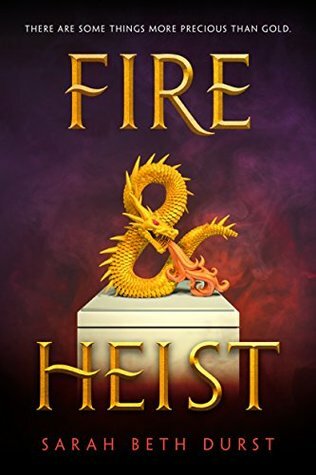 At this point, I’m not sure what is more exciting to me – the fact that we’ll have shapeshifting dragons, or the fact that this is a heist story. I guess it’s all good. “In Sky Hawkins’s family, leading your first heist is a major milestone–even more so than learning to talk, walk, or do long division. It’s a chance to gain power and acceptance within your family, and within society. But stealing your first treasure can be complicated, especially when you’re a wyvern–a human capable of turning into a dragon. Dragons and heists. Take my money. Ooh nice! This is definitely a new to me one! Hope you positively love it once you read it! Oh cool! I love this idea and I also love the simplicity of the cover. The story blurb sounds a little juvenile to me (me way it’s written) but hopefully it’s more YA than MG.
Me too, I think it’s listed as YA, but it’s so hard to tell with these publisher descriptions sometimes! Were-dragons? Add this to the fact that I keep meaning to read this author and this book is a must! Now that is a cute cover!